I couldn't find this specifically so wanted to ask if anyone has installed and used this hitch? The price of $79 and ease of installation are very appealing to me. Just want to see if anyone has any experience with it. Yep works great, there really isn't much difference in any of the bolt on hitches for a JK. You will need to lower the muffler to get the bolts in so lube up the exhaust hangers and make sure the exhaust is cool to touch when you install it. Wiring goes into the driver side taillight, you just need to remove the 2 screws on the right side of the light and be sure to put the foam block back, you'll see. The Quadratec instructions are always very detailed and tell you everything you need to know. 2qik2see and jmount78 like this. Yep, installed it on my 2014. Worked like a charm. Install is super easy. I didn't have to drop the muffler when I installed mine. I was able to fit a torque wrench with a shallow socket without hitting the muffler. I've done plenty of towing and I've had no issues with this hitch. mjscharlotte and DIRT BOY like this. Same here. My son and I just installed this on my '17 Rubicon, and other than a quick trip out to buy a shallow 18mm socket, it went on super easy. mjscharlotte and jmount78 like this. Did you guys have the stock muffler on when you did the install? I had no problems with the installation of either bumper on my 2dr. They use the same mounting holes on the frame that the hitch uses. We are talking about the same thing. 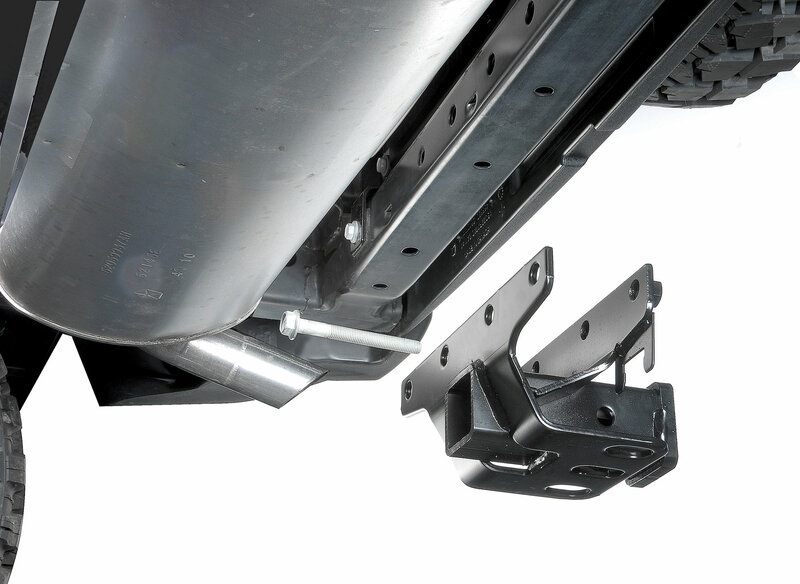 Any aftermarket bumper with a hitch uses the four holes in the cross member as an attachment point. I didn't have to remove the muffler on my JKUR. Lined up just fine. Great product. Be sure to PM them here for a forum discount. Yeah I got this for my 17 JKU WW. Easy install, didn't have to drop muffler. Electrical hook up simple. Wasn't paying the factory price for the max tow when all it was was the hitch and wiring. Same here, 2 door Rubi. We found it easier to do this with two people. I held the hitch, my son fed the driver's side end bolt in and finger tightened it. Then he did the same for the passenger side end one, then the two middle ones. There was a little jiggling and tapping to get everything lined up because it is done sort of blind, but no real issues. If the holes are aligned the bolts will go by hand. In my case everything fitted perfectly like OEM. Do not stat to clip the cable right away route it first the way you want it and then clip it- those clips are not easy to remove in one piece. I clipped mine and then figured out a better way to route the cable. Works great and had one on my JKU. No muffler issues and was 10 mins to bolt hitch and 5 for wiring. Installed on my 18 Sport without dropping muffler. Had to play with the bolts lining up a bit but they finally lined up. Used an impact socket and torqued to specs with torque wrench. I have this installed on my 2 door JK. I tow my small landscaping trailer often and it is great! The install instructions helped and this was easy to install. I highly recommend that hitch and wiring kit! This hitch will be different if you have the factory Hardrock bumper however.